I grew up in Springfield, MO and graduated from University of Missouri-Columbia in 2002 with a Bachelor of Arts in biology. 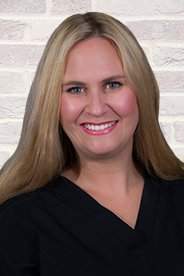 In May 2007, I graduated from the University of Missouri-Kansas City Dental School and worked with my father Dr. Stephen R. Young 3 days a week and at Jordan Valley 2 days a week. As of January 2013, my husband, Dr. Nathan Bauer, and I bought out my father’s practice and renamed it to 417 Smiles. I truly enjoy dentistry and feel lucky I am able to practice with my husband and father doing something I love every day.